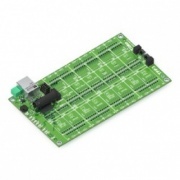 Size 2 Tibbo Project PCB, Gen 2 is a Tibbo BASIC/C-programmable board belonging to the Tibbo Project System (TPS) line. The board offers substantial speed and functionality improvements over its predecessor — the original TPP2 board. The TPP3(G2) is ideal for applications requiring no human-machine interface while calling for a significant number of I/O lines and functions. The board is an improved version of our original TPP3 device. Compared to the TPP3, the new TPP3(G2) boasts a much higher performance, as well as larger flash and RAM. 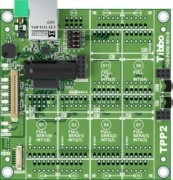 LTPP3 features the same dimensions and Tibbit capacity as the TPP3(G2) board, but runs Linux OS. 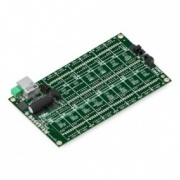 The board comes preinstalled with LTioS (Tibbo OS runtime for Linux) and Node.js. The Embedded Aggregate execution environment is also available (license purchased separately).